Sir Menzies Campbell has resigned as leader of the Liberal Democrats with immediate effect. In a letter to party president Simon Hughes he said questions about his leadership were "getting in the way of further progress by the party". Mr Hughes said the party owed Sir Menzies "a huge debt of gratitude". Deputy leader Vincent Cable will take over as acting leader until a new leader is elected - a decision is expected by 17 December. The official announcement was made by Mr Cable and Mr Hughes, who said Sir Menzies had taken the decision in the "interests of the party and of Liberal Democracy". In his letter, Sir Menzies said he had sought to restore stability and purpose, professionalism to the party's internal operations and to prepare it for a general election, when he took over as leader in March 2006. "With the help of others, I believe that I have fulfilled these objectives, although I am convinced that the internal structures of the party need radical revision if we are to compete effectively against Labour and the Conservatives," he said. 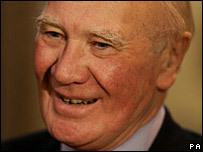 Party president Mr Hughes said Sir Menzies had brought "purpose and stability" to the party since he took over, after Charles Kennedy quit in January 2006. Former Lib Dem leader Lord Ashdown said he was a "man of honesty [and] decency" who had proved to have "remarkable political judgement". "That he has felt the need to resign this evening tells us more about the nature of modern politics than it does about Ming Campbell himself," he said. 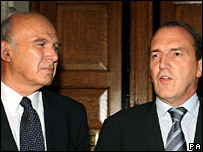 Speculation has been growing about the Lib Dem leadership, particularly since Prime Minister Gordon Brown decided not to call an early general election - and indicated he may not do so until 2009 at the earliest. And talk of replacing him as leader appears to have been stirred by poor opinion poll results - the latest being an ICM poll in the Sunday Telegraph which suggested Conservative support at 43% with Labour on 36% and the Lib Dems on 14%. Earlier on Monday Lib Dem peer Lord Taverne said Sir Menzies should step down within weeks, adding: "My general impression is quite clear, if there's not a change of leadership, the party goes down the drain." But a spokeswoman for Sir Menzies said he had made the decision to stand down himself and had handed his resignation letter to the party's president on Monday afternoon. The announcement appears to have taken the party by surprise - his Parliamentary aide Tim Farron said he was not aware Sir Menzies was about to resign. Mr Cable, who earlier on Monday had said he thought the leadership was "under discussion" but not under threat, added: "I'm very sad he felt he needed to step aside." But he added: "I don't think he was pushed. There was a very open debate about this immediately that Gordon Brown made his decision to postpone the election which could now be two years hence. "I think he took a fresh look at where he stood. He discussed this with his family and colleagues and decided the best thing he could do in the interests of the party was step aside." The prime minister has paid tribute to Sir Menzies as a "man of great stature and integrity who has served his party and country with distinction". And Tory leader David Cameron said he was a "fine public servant" who had had a distinguished parliamentary career, and wished him well for the future. Since he became leader Sir Menzies, 66, has repeatedly had to defend himself against accusations that he was too old to lead the party. Former Liberal leader Lord Steel told the BBC: "I'm afraid the media had it in for him from the start and he was never able to overcome that. Its been very cruel, very unkind and very unfair." The BBC has learned that the winner of the leadership election will be announced on 17 December - the party's Federal Executive Committee has agreed nominations will open on Tuesday after which potential candidates will have 15 working days to throw their hats in to the ring. Mr Hughes, who has twice stood for the leadership, has told the BBC he would not stand again - saying he had made that decision last year. "That's a categorical 'no'," he added.